This is an easy to cook seafood noodle dish using talangka (Asian shore crabs) fat and crab juice. Since talangka are so small, the only part that is usually extracted are the orange crab fat under the carapace. It is usually eaten by just squeezing the body to get the crab meat. 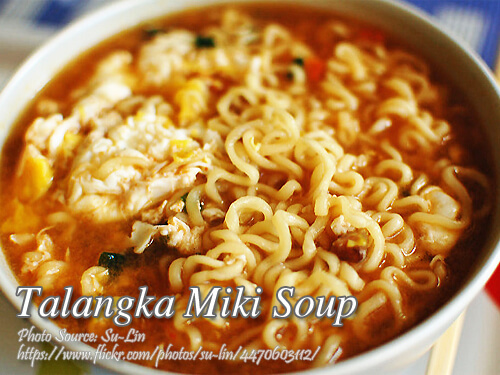 The noodles used in this soup is miki noodles which is thicker than the egg noodles and it is type of noodles used in cooking lomi. If you think that you needed to add some extra garnishing because it looks simple, you can add crab meat, squid balls, hard boiled quail eggs, or just crack some raw egg and put it a minute before it is done. To cook talangka miki soup; Wash talangka very well. Extract aligi (crab fat) and set aside. Pound talangka shells until fine. Add water. Strain. Boil stock and set aside. Sauté onion, tomatoes and aligi, season with patis and add to the soup stock. Add kamias and cook until tender. Take out kamias and mash with a little stock. Strain and add to the soup stock. Boil. Add miki noodles and cook 3 minutes. Green onion and kintsay for garnishing. Wash talangka very well. Extract aligi (crab fat) and set aside. Pound talangka shells until fine. Add water. Strain. Boil stock and set aside. Sauté onion, tomatoes and aligi, season with patis and add to the soup stock. Add kamias and cook until tender. Take out kamias and mash with a little stock. Strain and add to the soup stock. Boil. Add miki and cook 3 minutes. Before serving, sprinkle with green onion and kintsay. Serve hot. Makes six servings.